Today’s trend toward high-performance coolers, cups and water bottles seems almost rampant. Over the last decade, dozens of companies have sprung up to charge a premium for containers designed to keep drinks warm on your desk at work or cold for an hour at your kid’s soccer game. William Stanley Jr. might have laughed at the idea. You see, Stanley had already invented the perfect solution for keeping coffee hot and cold drinks cold way back in 1913. The difference is, Stanley’s invention was built to last forever. Adapting a welding process he used working on transformers, Stanley came up with a way to insulate a vacuum bottle with steel rather than glass. His time-tested invention is literally bulletproof in some scenarios. 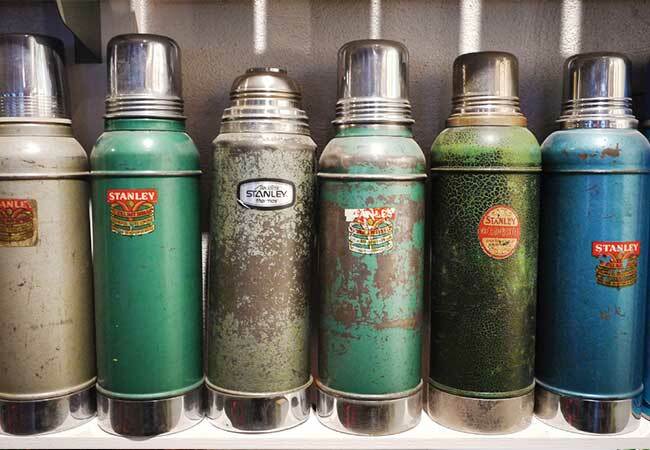 Chances are there’s an old green Stanley bottle stashed away with your grandfather’s dusty tackle that’s just as functional as it was when it kept his coffee hot during a day on the bay 50 years ago. And when we say functional, we mean it has been tested to keep your coffee piping hot for up to 40 hours or hold ice for more than six days. The rugged performance of Stanley has become legendary. It is the choice of tradesmen, hunters, anglers and outdoors enthusiasts who want to get on with the pursuit without having to worry about their gear. The term “Stanleyness” was coined to describe this incredible reliability under the most harsh conditions. Over more than a century, the company has collected stories from devoted owners relating the amazing feats of their Stanley bottles. Burned in fires, grazed by bullets, run over by 18-wheelers, there’s no limit to the abuse some of these bottles have survived, and though they might be a little dinged up, they’ll still keep coffee piping hot all day long. This bombproof durability is what allows Stanley to stand by its mantra, “built for life.” The company still makes its original green vacuum bottle, and it has expanded its product line to include mugs, cups, coolers, jugs, camp cookware, growlers, flasks, food jars and other storage solutions. Their products are so durable that they are able to back them with a lifetime warranty. For more amazing stories of Stanleyness and to check out all of Stanley’s rugged and functional gear, go to www.stanley-pmi.com.